Letters to Doris is a story about Doris Buffett’s philanthropic work told from the point of view of individuals who received a grant from the Letters Foundation, which she and her brother Warren started with the goal of giving a “hand-up” to those struggling with grave challenges through no fault of their own. Over the years, the foundation, through its emphasis on direct philanthropy, has given away more than $6 million and helped hundreds of people; Letters to Doris tells the stories of 23 of these remarkable individuals. 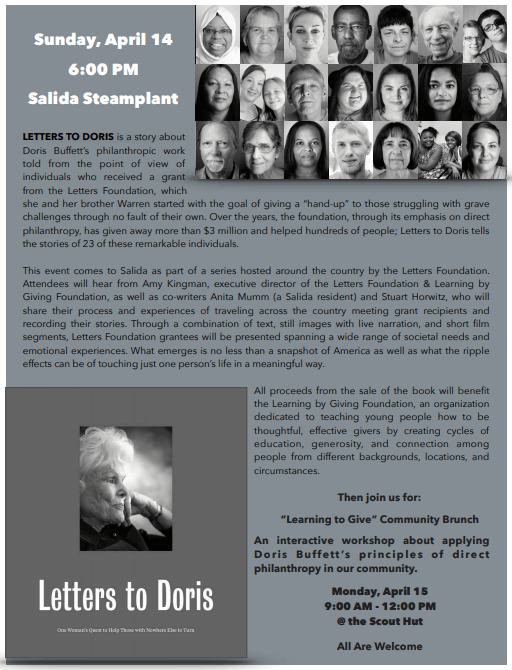 This event comes to Salida as part of a series hosted around the country by the Letters Foundation. Attendees of the event will hear from Amy Kingman, executive director of the Letters Foundation & Learning by Giving Foundation; Harriet Gordon, Letters Foundation program officer; as well as co-writers Anita Mumm (a Salida resident) and Stuart Horwitz, who will share their process and experiences of traveling across the country meeting grant recipients and recording their stories. Through a combination of prepared text, still images with live narration, and short film segments, a variety of the Letters Foundation grantees will be presented spanning a wide range of societal needs and emotional experiences. What emerges is no less than a snapshot of America, as well as what the ripple effects can be of touching just one person’s life in a meaningful way. Each event will end with a Q&A session where the audience is encouraged to both ask questions and reflect on their personal explorations. All proceeds from the sale of the book will be given to the Learning by Giving Foundation, an organization dedicated to teaching young people how to be thoughtful, effective givers by creating cycles of education, generosity, and connection among people from different backgrounds, locations, and circumstances. Cash bar & concessions will be available. No registration is needed an all are welcome for this free event (attendance of the Sunday event is not a requirement). Come learn from Amy Kingman and other key figures of the Letters Foundation about appying direct philanthropy in our home community. This will be a creative interactive endeavor with brainstorming, discussion, and Q&A.